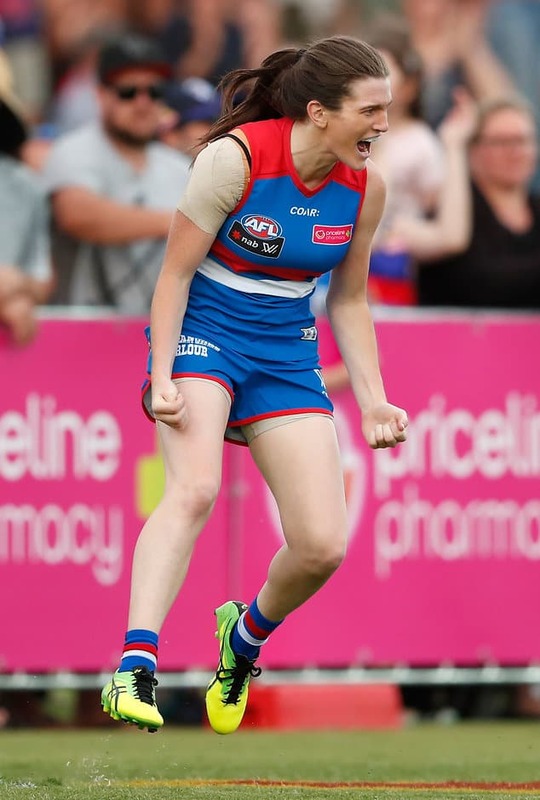 THE WESTERN Bulldogs kicked off their NAB AFL Women's campaign with a win against fellow premiership contender Fremantle on a blustery Saturday night by 32 points at the Whitten Oval. Played in front of a 10,100-strong crowd that fell just short of the ground's capacity, Emma Kearney racked up 21 disposals to help lead her side to victory. The hosts were first to hit the scoreboard with Kirsten McLeod booting a sweet running goal. Fremantle levelled the score through Melissa Caulfield but handed the hosts the lead at the first break with a turnover. A physical Dockers outfit held momentum in the second term but could not make the most of their opportunities, booting 0.5 for the quarter. The Bulldogs led by seven points at halftime and took over the game during the second half, with the Dockers managing just a solitary point. Dogs skipper Katie Brennan was marked closely by Ebony Antonio but ran out the game strongly to finish with two goals. Fremantle captain Kara Donnellan (13 touches, six tackles) led from the front, with Belinda Smith (16 disposals) also impressive. Bulldogs coach Paul Groves said the dominant victory was important, especially considering the competition is only seven rounds before the Grand Final. "I don't think you reassess expectations. The expectations are for us to be competitive and play good, hard, solid football. If that results in wins and we have fun doing it, then happy days for us. We've got a very solid list and we've got a lot of depth," he said. "It was a pretty big match-up just to kick start it and get that four points locked away. It's cut-throat because if you lose two games, you're probably going to miss the final. It's essential to win your home games here at the Whitten Oval." Fremantle had the momentum early in the second quarter but was unable to convert. The Dogs needed to regain the advantage and it was Brennan who stood up, despite having struggled to have an impact on the game up to that point. Kearney, who just came off a campaign for the Melbourne Stars in the Women's Big Bash League, found the skipper in the forward line and Brennan duly converted, much to the delight of her teammates. It might have been a convincing loss first up for Fremantle, but it is far too early to write the Dockers off. Windy conditions meant it was hard to kick accurately and if Michelle Cowan's team had made the most of their opportunities in the second term, they would have held a lead at the main break. The hardness the Dockers showed mean they will be a tough opponent this season. The Dogs had been peppering the goals in the third quarter but were unable to convert. A ball-up in their forward line would present the opportunity they needed. Ellie Blackburn, who was tagged all game by Lara Filocamo, found some space and snapped truly from a tough angle to nail her side's fifth goal and ice the contest. Plenty of attention had been paid to Brennan and Blackburn but one player who made sure her hits counted was Tiarna Ernst. The Bulldogs ruckman had plenty of presence and was integral to helping win the midfield battle, with clearances going their way 30-14.